Reinvigorate your complexion with this ultra-moisturizing, luxurious cream enriched with botanicals and nutritious micro-encapsulated time-released CBD Hemp oil to restore and hydrate any complexion. Aqua (Water), Aloe Barbadensis (Aloe Vera) Leaf Extract, Cetearyl Alcohol, Cetearyl Olivate, Sorbitan Olivate, Cocos Nucifera (Coconut) Oil, Helianthus Annuus (Sunflower) Seed Oil, Glycerin, Cetyl Palmitate, Sorbitan Palmitate, Sorbitan Olivate, Tocopherol (Vitamin E), Stalk Derived Cannabidiol (CBD), Hemp Oil, Simmondsia Chinensis (Jojoba) Seed Oil, Hamamelis Virginiana (WitchHazel) Bark/ Leaf/ Twig Extract, Xanthan Gum, Dimethicone, Caprylhydroxamic Acid, Caprylyl Glycol, Ethylhexyglycerin, Propanediol. 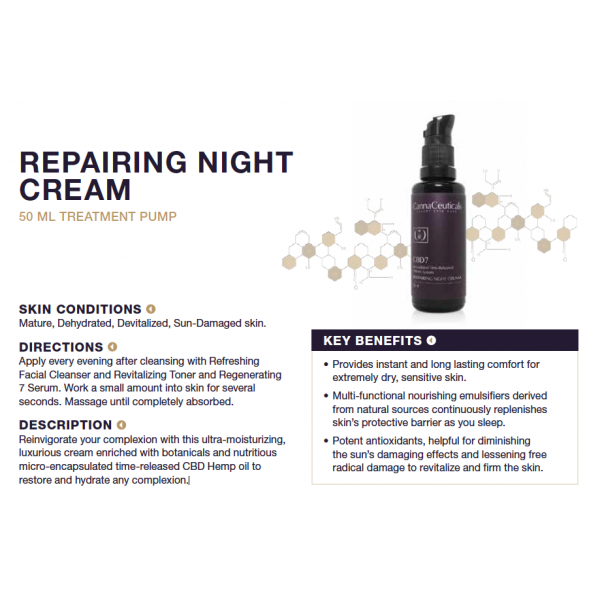 Cannaceutical Repairing Night Cream (50ml) 50ml size Reinvigorate your complexion with this ultra-moisturizing, luxurious cream enriched with botanicals and nutritious micro-encapsulated time-released CBD Hemp oil to restore and hydrate any complexion. COMPOSITION Aqua (Water), Aloe Barbadensis (Aloe Vera) Leaf Extract, Cetearyl Alcohol, Cetearyl Olivate, Sorbitan Olivate, Cocos Nucifera (Coconut) Oil, Helianthus Annuus (Sunflower) Seed Oil, Glycerin, Cetyl Palmitate, Sorbitan Palmitate, Sorbitan Olivate, Tocopherol (Vitamin E), Stalk Derived Cannabidiol (CBD), Hemp Oil, Simmondsia Chinensis (Jojoba) Seed Oil, Hamamelis Virginiana (WitchHazel) Bark/ Leaf/ Twig Extract, Xanthan Gum, Dimethicone, Caprylhydroxamic Acid, Caprylyl Glycol, Ethylhexyglycerin, Propanediol.